A Spanish-Jewish family name derived from the Arabic al-mu'alli ("the one who raises up"). In addition to those referred to in the following articles two other members of the family are known. A Salomon Almuli is mentioned in a Barcelona list for the year 1262 (Jacobs, "Sources," No. 212, p. 16). In a similar list occurs the name of Gento Almuli of Calatyud (Kayserling, "Jew. Quart. Rev." viii. 492). Son-in-law of Rabbi Meir, of Boton, whose collection of responsa he arranged for publication in the year 1660. A physician of Saragossa, Spain, at the end of the thirteenth century. He translated Maimonides' commentary on the fifth Order ("ḳ;odashim" = sacred things) of the Mishnah from the original Arabic into Hebrew. In November, 1296, Rabbi Simḥah was sent by the Jewish community of Rome to Spain to obtain a Hebrew version of the commentary; and he was advised by Solomon ben Adret to procure a capable translator in Saragossa. A copy of the full commentary on the first five Orders was to be found only in that town; and as the first Order had already been translated by Alḥarizi, and the second and third by scholars in Huesca, there remained for the scholars of Saragossa only the fourth and fifth Orders. On Simḥah's arrival at Saragossa Almoli expressed his willingness to undertake the translation of one Order; and the fifth was assigned to him. Unfortunately for the work, Almoli had not mastered the neo-Hebrew language; he had a defective manuscript to decipher, and, as he himself admits, he was not an experienced Talmudist. Furthermore, through want of care in copying, the translation has come down to modern times in a most deplorable condition. 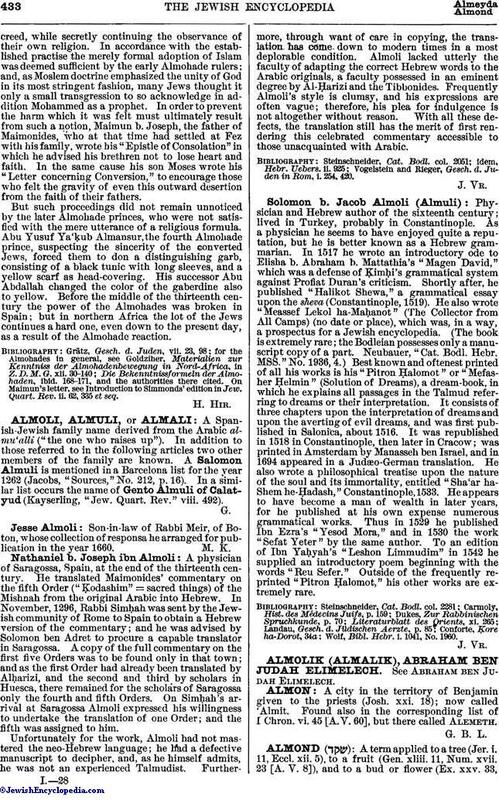 Almoli lacked utterly the faculty of adapting the correct Hebrew words to the Arabic originals, a faculty possessed in an eminent degree by Al-Ḥarizi and the Tibbonides. Frequently Almoli's style is clumsy, and his expressions are often vague; therefore, his plea for indulgence is not altogether without reason. With all these defects, the translation still has the merit of first rendering this celebrated commentary accessible to those unacquainted with Arabic. Vogelstein and Rieger, Gesch. d. Juden in Rom, i. 254, 420. Physician and Hebrew author of the sixteenth century; lived in Turkey, probably in Constantinople. As a physician he seems to have enjoyed quite a reputation, but he is better known as a Hebrew grammarian. In 1517 he wrote an introductory ode to Elisha b. Abraham b. Mattathia's "Magen David," which was a defense of ḳimḥi's grammatical system against Profiat Duran's criticism. Shortly after, he published "Halikot Shewa," a grammatical essay upon the sheva (Constantinople, 1519). He also wrote "Meassef Lekol ha-Maḥanot." (The Collector from All Camps) (no date or place), which was, in a way, a prospectus for a Jewish encyclopedia. (The book is extremely rare; the Bodleian possesses only a manuscript copy of a part. Neubauer, "Cat. Bodl. Hebr. MSS." No. 1936, 4.) Best known and oftenest printed of all his works is his "Pitron Ḥalomot" or "Mefasher Ḥelmin" (Solution of Dreams), a dream-book, in which he explains all passages in the Talmud referring to dreams or their interpretation. It consists of three chapters upon the interpretation of dreams and upon the averting of evil dreams, and was first published in Salonica, about 1516. It was republished in 1518 in Constantinople, then later in Cracow; was printed in Amsterdam by Manasseh ben Israel, and in 1694 appeared in a Judæo-German translation. He also wrote a philosophical treatise upon the nature of the soul and its immortality, entitled "Sha'ar ha-Shem he-Ḥadash," Constantinople, 1533. He appears to have become a man of wealth in later years, for he published at his own expense numerous grammatical works. Thus in 1529 he published Ibn Ezra's "Yesod Mora," and in 1530 the work "Sefat Yeter" by the same author. To an edition of Ibn Yaḥyah's "Leshon Limmudim" in 1542 he supplied an introductory poem beginning with the words "Reu Sefer." Outside of the frequently reprinted "Pitron Ḥalomot," his other works are extremely rare. Wolf, Bibl. Hebr. i. 1041, No. 1960.